Always make sure that there is enough clearance between the hardware on the primary door and the hardware on the screen door. If there is not enough room you may be able to create more room by adding another door stop. Another option is to hinge the screen door opposite from the primary door. 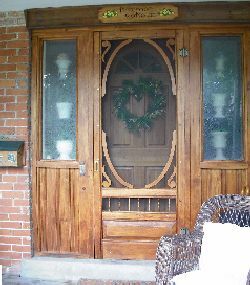 The three wood screen doors shown on this page are nice examples of how to "dress up" a door by adding fretwork or gingerbread corner brackets. The spendrel or center bar will also add character. When I mention the word screen door many of you would think that I'm talking about the sliding patio screen door. However, there is another screen door that I want to discuss, the one that is hinged and installed in front of your main or back entrance door. There are a few reasons why you may want to consider installing a screen door. A screen door will keep out flying insects, provide ventilation and lets in cool breezes which will cool down the house while at the same time it will give you a clear and full view of what is going on outside. Although you have a choice of aluminum and wood screen doors most consumers will opt for the wood screen door. A well designed wood screen door will add grace and beauty to any home but especially to older homes which have already character in the first place. I think that wood storm doors have been around "forever". For a time it looked like they were all being replaced by storm doors with the advance of central air conditioning. 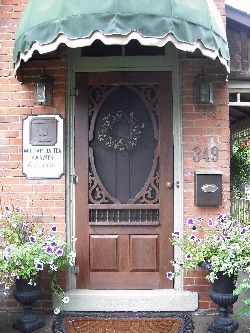 However, today the decorative wood screen door is in demand again. The possibilities of matching the wood screen door with the style of your home are endless thanks to the available features such as old-fashioned fretwork or gingerbread corner brackets. Adding detail and corner brackets to the spendrel or center bar will not only enhance the look of the door but also will provide rigidity. Wood screen doors can be made of Oak, Douglas Fir, Western Red Cedar, Redwood, Mahogany or pine. Most wood screen doors sold in home improvement stores are made of paint or stain grade pine. A store bought screen door may have to be trimmed to fit. Normally the screen door is attached to the door jamb in front of the door stop. Trimming the door may be tricky and you will need proper tools to do a neat job. If you lack the proper tools or know-how you may want to call a carpenter to do the job for you. Believe me it doesn't take much to ruin a good door and end up buying another one. For the door to operate properly you need a clearance of 1/4" (6 mm) for both sides and top and 1/2" (12 mm) at the bottom of the screen door. If you order a screen door online follow the instructions for measuring the door. Methods of measuring and required clearances are not the same from all manufacturers. You will also have a choice of "dressing up" your door with a wide variety of fretwork, corner brackets and spendrel or center bar.